Athos monks do not eat meat. If you use the cookbook of the famous father Epifanios – The cuisine of the Holy Mountain Athos – you will only find vegetarian food and meals with fish, molluscs and shellfish, like the one on page 55: fresh cod with little green squash, which I cooked this weekend. Delicious and easy to make! I drank a Pinot Grigio from Zenato from Italy with it. Place the cod in a pan and cook it for 45 minutes together with garlic (3/4 cloves) and onions (500 gr fish: one onion). Add the (small) squash (one for each person) and finally the lemons juice, serve with potatoes or bread. But it looks like sometimes even Athos monks do eat meat, at least at Mylopotamos, because in the cookbook in Dutch “Culinaria Greece” by Marianthi Milona, page 210 -213, I found a chapter about cooking on Mount Athos by father Epifanios. 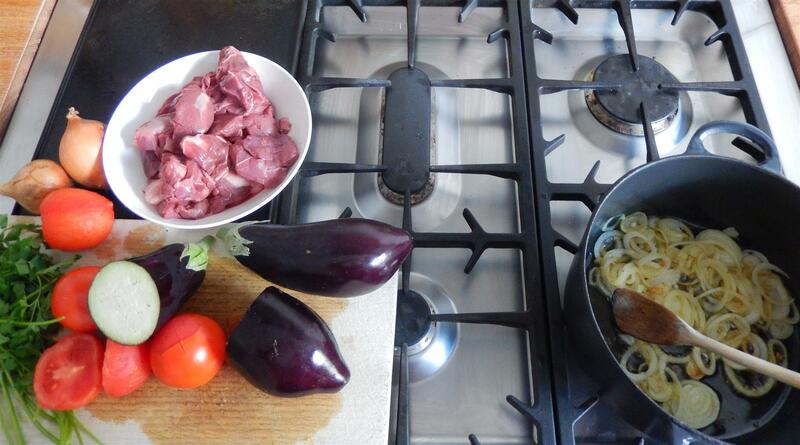 The recipe is called “Agrioguruno me melitzanes (αγριογουρουνο με μελιτζανες)” – wild boar with eggplant. Again, very easy to make and delicious. First slice the unions and bake them in butter or olive oil. Then add the meat and after 4 minutes add the sliced tomatoes and water (+salt and pepper). Let it simmer for two hours or more. Then fry the eggplant in a pan with olive oil on a high fire. Add the eggplant to the meat in the last five minutes, and sprinkle the parsley over your plate. Serve with potatoes or bread. 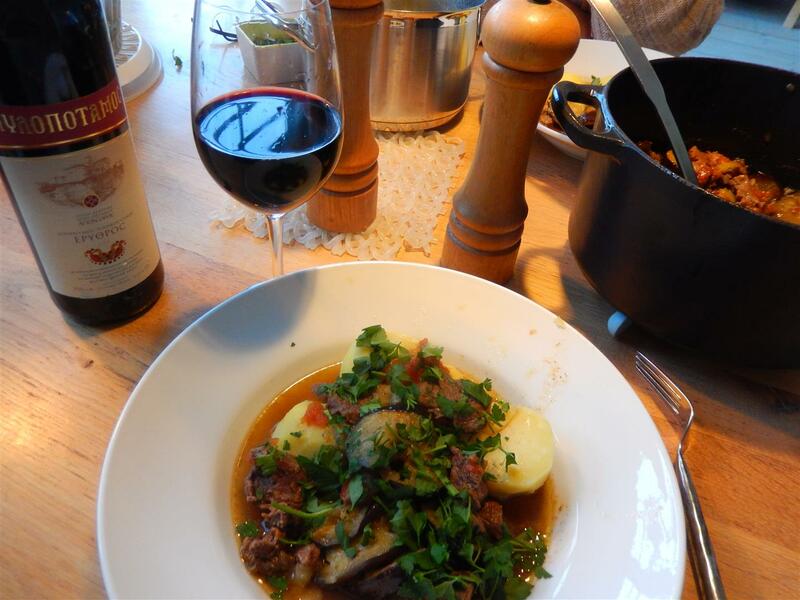 Drink your meal with a Mylopotamos wine, if available. 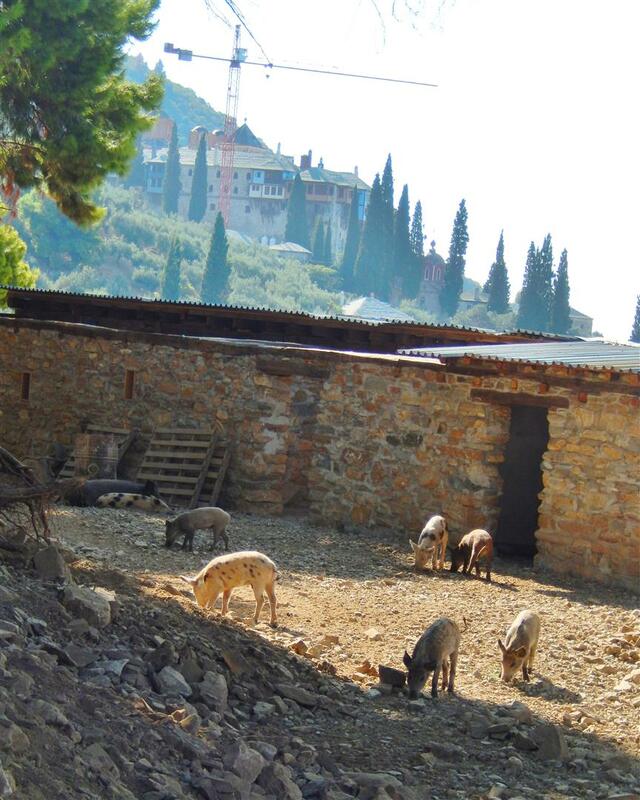 A reason why I think wild boar are consumed on Mount Athos is because I took this foto in September 2013: just before arriving at Docheiariou monastery we saw this shed with approx. 15 wild boar! 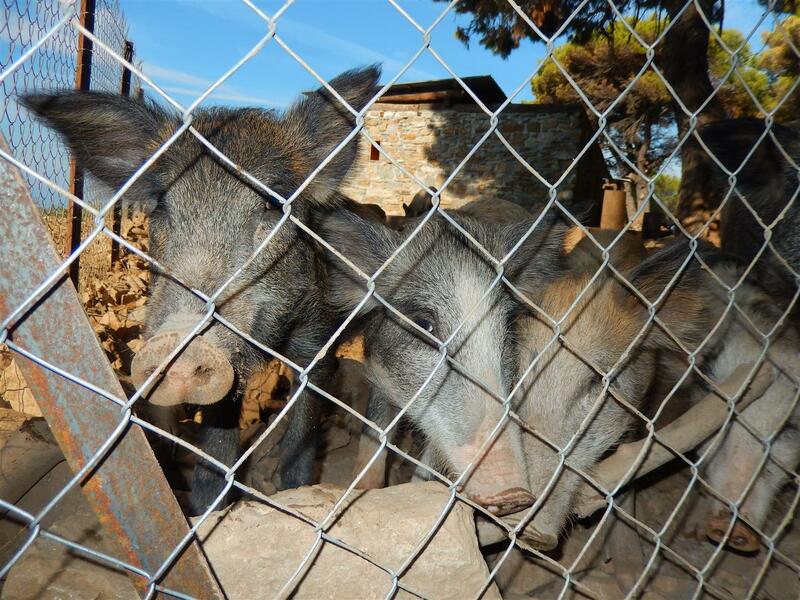 Wild boar on Athos: why are they kept? For own consumption or for commercial reasons ? Marianthi Milona published a cookbook in 2011 in Greek about Mount Athos cooking, “Recipes from the Garden of the Virgin Mary” (ISBN 978-960-6691-68-3). This entry was posted in books, food and tagged boars, Epifanios, recipes. Bookmark the permalink.